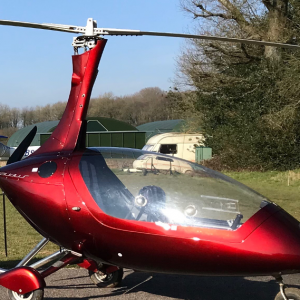 The Calidus is one of the new generation of Gyrocopters in the UK, BCAR Section-T compliant, factory built in Germany with final assembly in the UK at Rotorsport UK Ltd’s CAA approved workshops. Gyrocopters have come a long way since Little Nellie in the James Bond film You Only Live Twice and are now practical, safe and serious fun to fly machines. 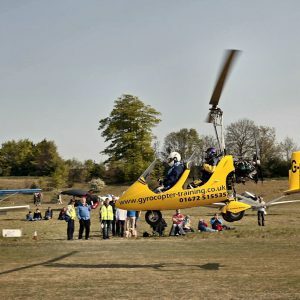 The Gyrocopter complements our other flying activities. In many ways the Calidus is very similar to our present microlights, using the same Rotax engine and having a similar range and performance. It does however have an increased take off weight (500 kg), can land in a much smaller space and can handle 40kt winds without incident. The licence required is the PPL(G) which is more hours than the microlight but then the aircrafts abilities are much broader. A one-day intensive course. You will learn the basics of Gyrocopter operation. Five day intensive course, Monday to Friday (or by arrangement). 10 hours flying and short briefings. 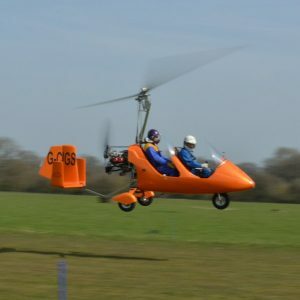 This course is designed to kick start your Gyrocopter flying, and is based on one to one for the 5 days. Ten day intensive course with 20 hours flying over two weeks Monday to Friday (or by arrangement). This course will complete almost all of your dual instruction on a one to one basis, and gets you through nearly 50% of your licence requirements. This course is held on weekdays over 4 weeks (or by arrangement). Includes 40 hours of flying and the short briefs required for each lesson (believe me you’ll be glad of the break by close of play on Friday). 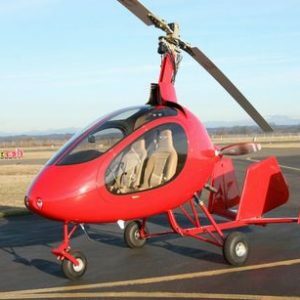 G.S Aviation uses the fully enclosed Calidus Gyroplane, this is a low hours aircraft with the most up to date technology and full cabin heat.